Description: Great for entertaining. Plain little chunks of white meat of chicken breast along with veggies on a wooden skewer. Just marinated them before putting on your grill, or take them of the skewer for your next stir fry dish. Nutritional Info: Portion Size: 1pc. 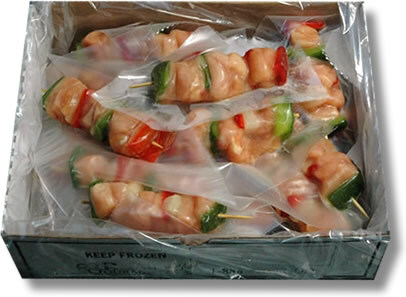 Thaw kabobs in refrigerator. If desired, kabobs may be marinated in soy sauce for teriyaki kabobs, BBQ sauce or Italian dressing. Grill: Cook over medium heat for 7-10 min, turning to cook evenly. Broil: Preheat broiler. Place kabobs on broiler pan located on second from the top position. Broil 15-20 min, turning kabobs to brown evenly. Contact Grill: Grill for 4-5 min.